Ismini Phillips has been teaching Pilates since 2007 and set up Ismini Phillips Studios to offer health and fitness solutions in Tonbridge. She is a qualified Pilates teacher, bootybarre teacher, Back4Good practitioner, MS/neurological conditions exercise specialist, and breast cancer exercise specialist, running the Pink Ribbon Program. Ismini offers a variety of mat and equipment classes, running sessions that are suitable for all, including those returning to exercise. Ismini also offers education in the field of Pilates, working to teach others about the practice. She is the UK representative and master trainer for the Pink Ribbon Program, a supervising teacher for Body Control Pilates and a Master Trainer for bootybarre. For Ismini, Pilates is a way of life and she takes a holistic approach to it. She has been involved in dance and fitness from a very young age, and first came across Pilates when pregnant with her third child. She had suffered with back pain and sciatica, and found that Pilates offered the perfect solution. She was able to continue with classes and salsa teaching throughout her pregnancy and well into her third trimester. Ismini’s passion for Pilates became a major part of her career. She was awarded her Level 3 Pilates Teacher Certification by Future Fit Training and Body Control Pilates. She has continued her education with Body Control Pilates and qualified as a Back4Good Practitioner and BackCare Professional, having completed the Body Control Pilates Level 4 Low Back Pain Certification. This enables her to run the specialist Back4Good and HealthyBack classes for the management of low back pain. Ismini is a member of the Body Control Pilates Association, REPS and the BackCare Charity. 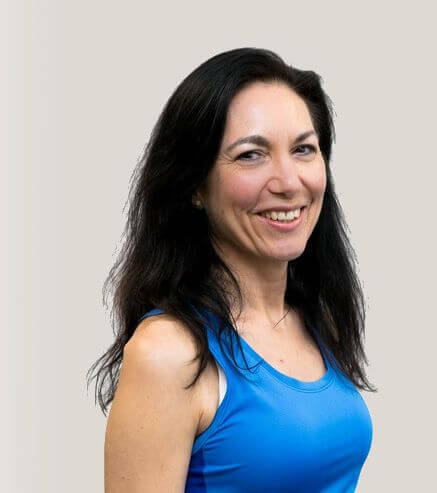 Since qualifying as a teacher, Ismini has taken up training with various bodies, including Body Control Pilates, Alan Herdman, Mary Bowen, Eric Franklin, the Australian Physiotherapy & Pilates Institute, Michael King, Future Fit Training, Tracey Mallett, Nathan Gardner (co-author of The Pilates Bible), Linda Gardner and more. Her approach makes her different to other Pilates teachers: Ismini offers a confidential, organic and all-round approach that helps her clients with postural problems, abdominal and core strength, back problems, rehabilitation after injury or surgery, cardiovascular fitness, post-cancer care, ante- and post-natal fitness and more. In her practice with clients Ismini has had amazing results. Ismini works in various specialist areas. She is a certified Pink Ribbon Program Breast Cancer Exercise Specialist and UK rep and Master Trainer of the programme. She is known to be one of the Pink Ribbon Program’s most experienced UK breast cancer rehabilitation specialists, having worked with this client group for over seven years. Ismini also has experience in working with people affected by Huntington’s disease, multiple sclerosis, Parkinson’s disease and other neurological conditions. She trained with Mariska Breland, a leading force in exercise and Pilates for neurological conditions, and has gained a certification in this field. In October 2015, Ismini was invited by Tracey Mallett to join her in LA to train as one of the UK’s four bootybarre Master Trainers. If you’re looking for a fun, energetic and all-round workout with a difference, then Ismini’s bootybarre classes offer you a fusion of Pilates, ballet, dance and yoga, with high-intensity cardio intervals. Ismini can carry out full body readings before you begin any new exercise programmes at the studio, having completed Conscious Embodiment training with Zachary Dacuk. Currently, Ismini is completing her Level 4 Pilates qualification with Body Control Pilates (the only one of its kind) and is also undertaking training in the Feldenkrais method with Garet Newell, a teacher and educator directly trained by Dr Moshé Feldenkrais prior to his death in 1984. Operating within various healthcare settings, Ismini often finds herself working with local GP practices and alternative medical practitioners, including The Chislehurst Chiropractic Clinic, The Chislehurst Clinic, The Sloane Hospital, and The Maple Osteopathic and Naturopathic Clinic to name a few. She works in conjunction with them to encourage the healing process through effective exercise, which improves overall confidence and quality of life for her clients. As a teacher, Ismini is committed to her own development and takes weekly private sessions with her tutor, a Body Control Pilates educator. She attends teacher-only classes to ensure that her own technique is up to date and that her own body is working correctly.